Every adoptee has a unique and compelling story to tell. 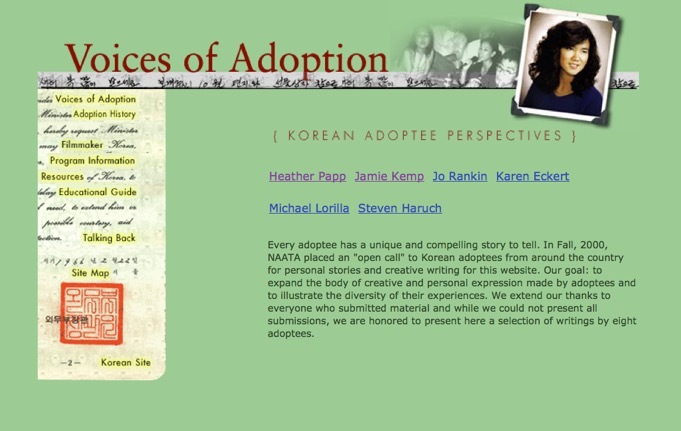 In Fall, 2000, NAATA placed an "open call" to Korean adoptees from around the country for personal stories and creative writing for this website. Our goal: to expand the body of creative and personal expression made by adoptees and to illustrate the diversity of their experiences. We extend our thanks to everyone who submitted material and while we could not present all submissions, we are honored to present here a selection of writings by eight adoptees.